Attention baseball fans, today we’re launching a triple-header of new themes just for you. 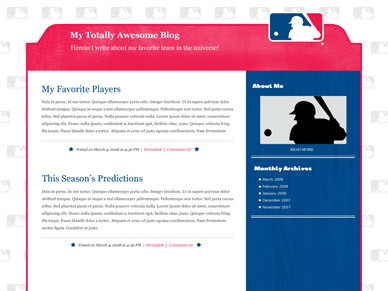 We’ve partnered with MLB.com to bring its Fan, Modern, and Retro blog themes to WordPress.com. The designs range from minimal (“Modern”) to loud (“Fan”), and there’s even a throwback to old MLB Club logos and styles for a bit of nostalgia (“Retro”, of course). But that’s not all: you can also customize each of the MLB themes with your favorite team’s colors and logo. So whether you prefer O’s to A’s, pinstripes over blues, or Red Sox instead of White, we’ve got a theme for you. We would also like to welcome the MLB.com blogging community, and thank them for waiting patiently in the bullpen while we prepped their new home here at WordPress.com. MLB bloggers: if you have any questions, please review our FAQ about the transition to WordPress.com, read our support guides, or feel free to get in touch. 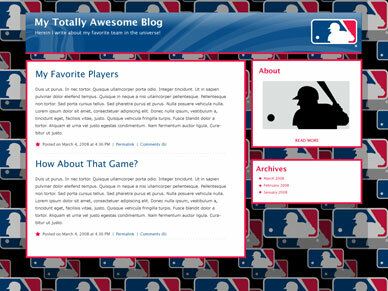 So go ahead and join folks like Tommy Lasorda, Ozzie Guillen, Keith Olbermann, and thousands of other blogs of summer, by heading over to Appearance → Themes → Friends of WordPress.com in your WordPress.com dashboard to activate an MLB theme, and Appearance → Theme Options to pick your favorite team. Ha, this is very FUN! ( If you’re loving baseball! ) I wish a lot of fun for those, which will use it! 😉 *hrhrhrh* Awesome. Wow, Awesome stuff. You guys are amazing. You impress me every time you bring out a new theme. These themes will be a lot of fun for Baseball fans. Will WordPress be partnering with other Friends to develop more special interest themes? will there be more like this with other sports? hmm..looks so nice..Wordpress show the surplus again, but I don’t like baseball..likely football will better than it..
Really Cool! Sport lovers thanks. I want football themes, may you launch some, please! Realy good. I love it WordPress. thanks. “Any consideration being given for team customizations for Minor League teams?” asks the guy with a Gravatar image of a guy wearing an Albuquerque Isotopes hat. Now that is cool. I really like the Fan design. Bring tennis and the NHL to WordPress too! Welcome to the new MLB bloggers and thank you for helping WordPress.com roll over to 20 million users. That’s a home run in my book. I’m not a baseball fan, but if I was, I’d be freaking out over this…LOL. Great job, WordPress! These themes look fun and inviting. It sounds really cool! Fan seems too loud for me, but Retro and Modern look really good. Great job! Oh, and I agree with Eric. A tennis theme would be cool! Very nice. I’m liking this! This is GREAT news for Major League Baseball (MLB) fans everywhere! A friend recently turned me on to WordPress for my own baseball site, and I have loved the beautiful simplicity of using it for sharing my MLB passion. This is smart for MLB, and great for baseball loving WordPress users! While I am no longer a rabid fan of MLB, I did take a look at the work done by your artists and liked what I saw there very much. I had the twinge of nostalgia I had for baseball when I was a kid. If we could do then what we could do now with technology, I would have stayed such a sports fanboy. Keep up the great work, guys. It’s a real pity that baseball is not a priority for me. Such a fun theme to use. Will you one day cater to figure skating also? That’s what I do. Very awesome idea, WP. Thanks. I’m sorry, but as a European, I fail to see the appeal of, or the need for, a bunch of themes that aimed solely at US bloggers and readers. Ironic that you launch this layout, the day that MLB Hall of Famer, Harmon Killebrew passed away. It is his silhouette that was used for the Major League Baseball logo. MLB won’t let us use their logo because it’s right protected, but as a member of WordPress it’s okay. Who knew? That’s good news. Thanks WordPress. That’s cool! I don’t like baseball that much, but it is still cool. If you could do that with football or soccer, that would be great! I went to the theme showcase and it says that using these things requires agreeing to a page of unintelligible legalese separate from wordpress’s own terms and conditions? I’m thinking ‘no’. WP has gone “three for three” today. Good job thinking outside the … box. I’m loving this a lot! Awwwwww yeah. I’m not a baseball fan, but I appreciate the MLB’s endorsement. If you guys end up with NHL or NFL themed sites by the way, I am so there. Glad to see everyone digs our new Major League Baseball themes and welcome! Please join us on the MLB.com community blog anytime and get to know other MLB fans. Thanks, Paul and everyone at WordPress.com for helping to make this happen! ahh. a sports theme. i really like this. will you be making an NBA theme, soon? I’m not particularly into baseball, but thanks a lot for the sake of those who are. Way to go! That’s a great theme, good job. I’m not a baseball fan but but it looks cool. MLB will be heating up more after the NBA Finals – Thanks for keeping us updated! Let’s go Oakland! Clap clap, clap clap clap! I want a skateboarding theme. oh man i don’t even usually get excited about new themes and stuff but this is sweet!!! Can we just get it over with and start football season already? they did this cause they integrated mlb’s blogging site, mlblogs, with wordpress. So they moved all the mlblogs here. Example- my blog, Tiger Life, was a mlblog. Now it’s here. Smart move and a great idea WordPress! Bravo! Thanks wordpress for providing a great blogging system, and quality entertainment as well. I’m really enjoying WordPress since we came from MLBlogs. Thanks to the WP community for being so cool and checking out my Phillies Blog! This was sporty and exciting enough to motivate many big wig with new ideas of unique collaborations. more of this. how about one for apple fans. keep up the great work. Good – now give us a live twitter and editable calendar widget. WordPress- You make me proud to be an American. Thanks to wordpress. This the awesome blogging system ever. I really love my own blog.